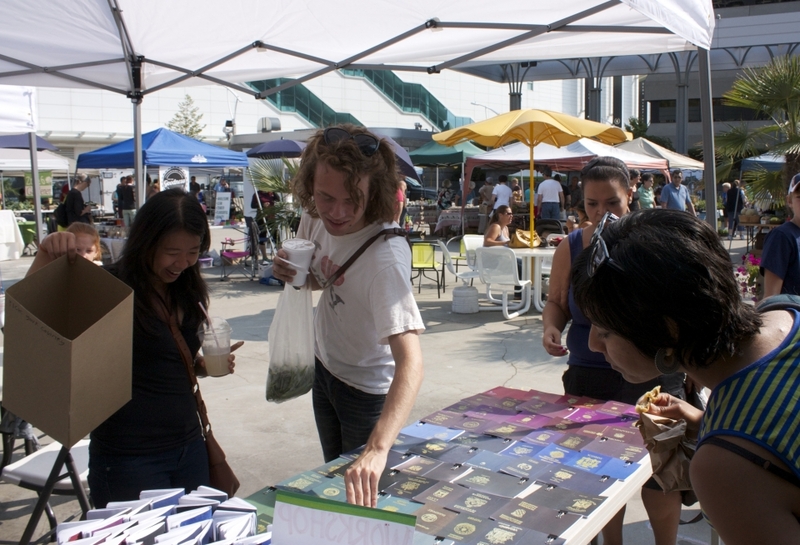 Andrew Stahl started the Transcultural Art Network to instigate transcultural artist residencies at the Slade School of Fine Art from various sources of funding. As we know there is a history of adherence to particular cultural understandings of contemporary art in education. International residencies can be a means of globalising the curriculum and broadening the understanding of the context today by having culturally diverse artists-in-residence participating in the programme and producing art and interacting and revealing their processes and theoretical approach. See Andrew Stahl's presentation on art and the international curriculum at the Colloquium. Artist-in-residence from 1 February - 1 March 2008 from Guangzhou Academy of Fine Art, China. 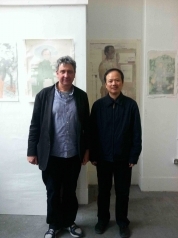 Xiaopeng was based at the Slade Research Centre, Woburn Square; he gave a lecture on his practice and participated in the seminar and crit structure of the undergraduate programme. His residency was funded by the Slade. Artist-in-residence from 8 February - 10 March 2008. From Visual Arts Department, School of Fine & Applied Arts, Bangkok University, Thailand. Nipan was based at the Slade Research Centre, Woburn Square; he gave a lecture on his practice and participated in the seminar and crit structure of the undergraduate programme. The Slade and the British Council funded Nipan’s residency. (2007), Show Me Thai at the Museum of Contemporary Art Tokyo, Japan (2007) and Monologue/Dialogue UK - Thai art today, Bangkok University Gallery Bangkok (2006). Solo shows include Birthplace at Bangkok University Art Gallery, Bangkok (1997) and Nipan Oranniwesna at Clay Gallery, Tokyo, Japan (1996). Nipan created work and an installation for the exhibition Monologue/ Dialogue 2 - An Exhibition of Thai and British Artists - Monologue/Dialogue Part II at Bishoff /Weiss Gallery 7 March - 12 April 2008 organised by Andrew Stahl. 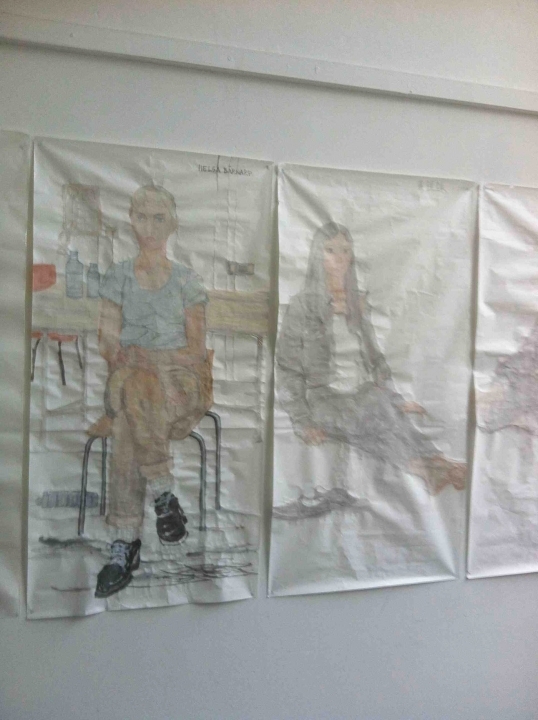 Artist-in-residence from 23 January - 18 March 2012 (originally scheduled for 2011 but delayed). Rafat Asad was resident for eight weeks and made work at the Slade Research Centre, Woburn Square. He participated in crits and seminars and gave a lecture on 31 January presenting his work and the work of contemporary Palestinian artists to both staff and students. At the end of his stay he opened his studio to students and visitors. Charles Asprey, co-founder of Art School Palestine and the Slade School of Fine Art sponsored his visit. Rafat Asad works in a variety of media including painting, installation and video. He studied BA in Fine Arts specialising in Painting at An Najah University, Nablus. He has participated in a number of international workshops and residencies including Delfina Studios London (where he had a show in 2006). He also has shown widely including in New York, Switzerland, Ramallah, Beirut, Saudi Arabia, and France. Momo delivered the Contemporary Art lecture at the Slade School of Fine Art on the 5th December 2012 and participated in crits, seminars and gave a series of one to one tutorials. 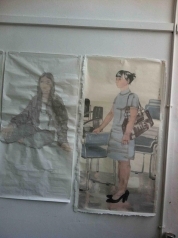 She was based in the Slade Professor’s studio in the main Slade building. Her residency was sponsored by the Arts Club Charitable Trust. 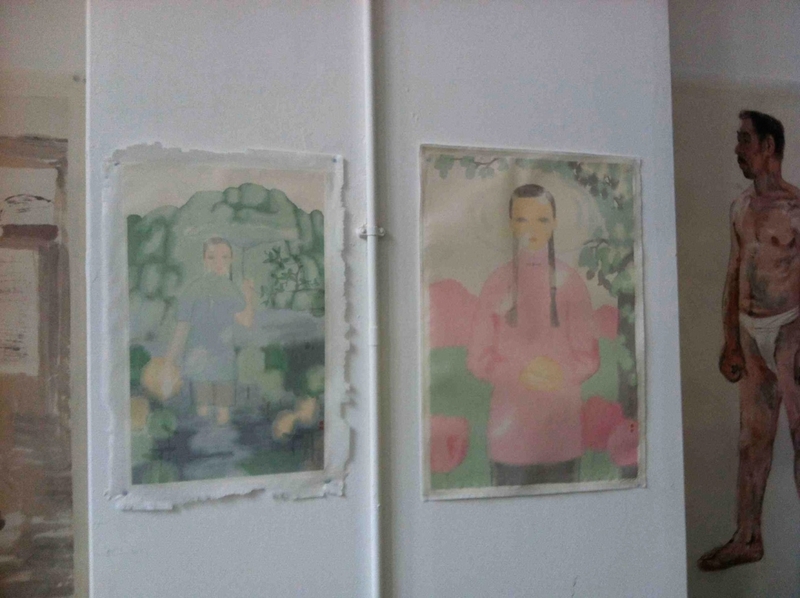 Leung Mee Ping is based in Hong Kong and has had an international career exhibiting worldwide in China, Japan, Switzerland, Germany and many other countries, this year she was in the City States section of the Liverpool Biennial. She graduated from L'Ecole Nationale Supérieure des Beaux-Arts, Paris, France and obtained her MFA from California Institute of the Arts, USA. Based on the perception of daily life, her work uses a wide range of media. Artist-in-residence from 1 February - 25 February 2013, Professor and Director of Postgraduate Studies and Vice-Director of the Chinese National Academy of Arts. 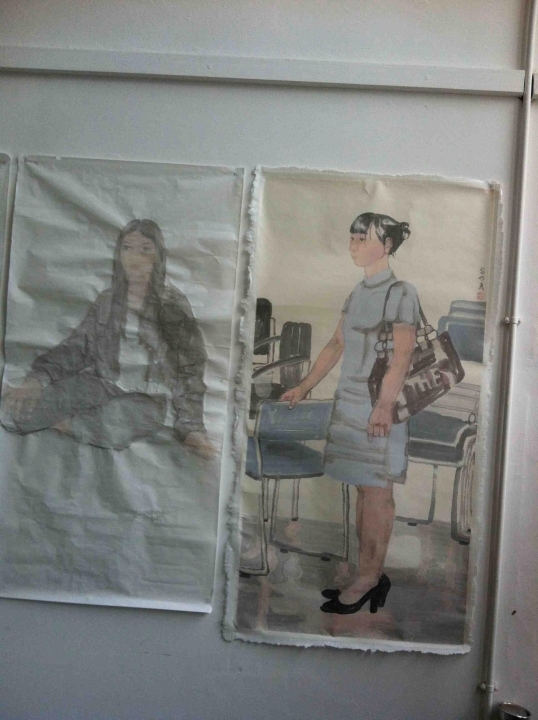 Tian Liming participated in an undergraduate painting crit and gave a lecture on traditional Chinese painting and his own work and gave a considerable number of individual tutorials. He was based in the Slade Professor’s studio where he produced a substantial body of work using traditional Chinese ink and paper. He worked from life and encouraged a group of undergraduate painting students to work alongside him in his studio and also to pose for his paintings and for each other. 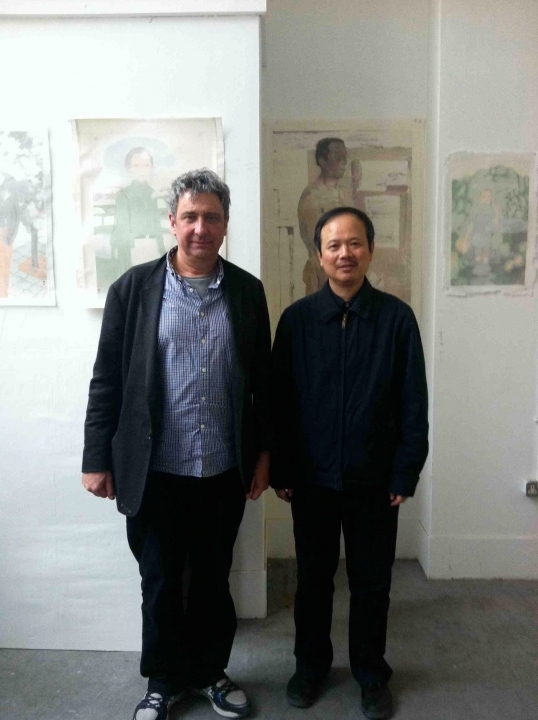 His visit was been generously supported by the UCL Simon Li Visiting Chinese Scholar Fund. Tian Liming is an extremely renowned and distinguished painter. He graduated from the Central Academy of Fine Arts in in Beijing in 1984 and continued his study there before becoming the Dean of the Department of Chinese Painting then moving to his present position at the Chinese National Academy of Arts in Beijing. He is known for his figure paintings in ink and wash and his innovative depiction of light. 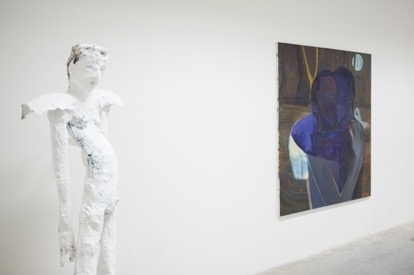 Under The Same Sky, Susan Collins & Tuksina Pipitkul, Bangkok University Gallery, Thailand, was an exhibition of work which came out of Tuksina Piptkul’s residency in at the Slade School of Fine Art and Susan Collins’s residency in Thailand as ASEM DUO Thailand 2010 exchange fellows. Both artists work with similar subjects: landscape, sky, sea from very different perspectives. ‘Under the Same Sky’ takes its inspiration from the landscape, cityscape, sky and sea of Thailand and England and creatively explores these two different approaches, processes, artists and places. Artist-in-residence from 28 October to 22 November 2013. From Nagenda International Academy of Art and Design (NIAAD) and Chair of the Department of Fine Art at Makerere University, Uganda. He was been funded by the Arts Club Charitable Trust and the Slade Research Committee. Born in 1967 Kizito was the youngest of a family of 12 children 6 of whom are surviving. The son of the late Sebastiane Kasujja and Maria Federis Nansubuga, Kizito grew up in the rural area of Masaka Districts, south of the capital city of Uganda. His parents were progressive farmers and his mother, the hero of his life, a great craft maker. 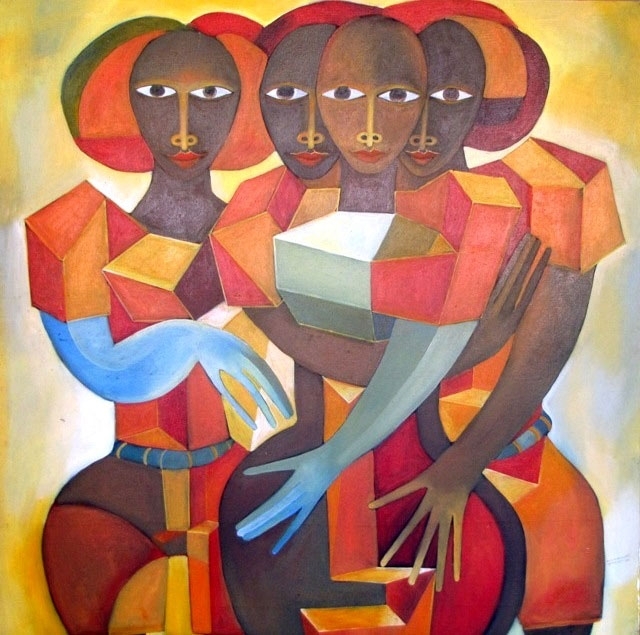 Kizito traces his beginning as an artist to his mother who taught him, from an early age, the art of craft making. Kizito joined the Magaret Trowell School of Fine Art, Makerere University, where he studied painting, sculpture and ceramics, graduating in 1993 with a first class honours degree. Later he was called back to join the faculty staff as an assistant lecturer. In 1998, he completed his MAFA degree in sculpture and in the same year embarked on his PhD in African Art history. In 2003, he completed his PhD at Makerere University and joined the Burren College of Art in the Republic of Ireland where he completed his MFA in painting. 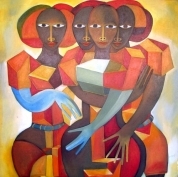 In 2008 Kizito realised that time had come to reform art teaching in Uganda and he decided to start a new Institution of Art. By chance, before going to Ireland Kizito had started building a house for himself along Kampala Entebbe Highway. 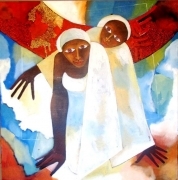 Using his personal savings from the sale of his art in Uganda and abroad, he completed his house and started the Nagenda International Academy of Art and Design (NIAAD). With 7 students, NIAAD opened its doors to the public in February 2009. Since its inception in 2009, the academy has trained 130 students. It currently has 90 full-time students. NIAAD offers two-year diplomas in Fine Art, Textile and Jewellery Design, Fashion Design, Visual Communication Design, a Diploma in Art Education for senior secondary teachers and a two-year certificate in Art and Design. It also offers free bead designing classes to single mothers as a way of financially empowering them. Kizito is also the founder of Fr. Ndiwalana Memorial Technical Institute in Katende and the co-founder of Ndembe primary school in Kasebuti which currently educates 150 children in the rural areas of Kalungu district. As well as opening NIAAD, Kizito is currently Chair of the Department of Fine Art at Makerere University. His art explores the relationship between texture and patterns and sometimes challenges the social, cultural and political set ups in Africa and beyond. He has exhibited in Africa, USA, and Europe. Many of his works are in both private and public collections. Tintin Wulia (b. 1972, Denpasar) is internationally recognised for socio-politically charged works presented in witty, often interactive and participatory artworks. Her background in architecture and music (BEng/Architecture, Universitas Katolik Parahyangan 1998 and BMus/Film Scoring, Berklee College of Music 1997) as well as her practice-based research training in art (PhD/Art, RMIT University 2013) contribute to her transdisciplinary works that are often process-based and systemic, taking place across mediums. She fuses installation, mural/drawing, video, sound and performance amongst others, hacking and repurposing ready-mades, e.g. IKEA products, neodymium magnets, living matter, surveillance cameras and arcade game machines, factoring the materials' original systems into her work. Wulia has exhibited in major international exhibitions such as Istanbul Biennale (2005), Yokohama Triennale (2005), Jakarta Biennale (2009), Moscow Biennale (2011), Gwangju Biennale (2012), Asia Pacific Triennale (2012), Jogja Biennale (2013) and Sharjah Biennale (2013). Her works have also been shown with prominent institutions such as ZKM/Center for Art and Media (Karlsruhe), International Film Festival Rotterdam, New York Underground Film Festival, Hiroshima Museum of Contemporary Art, National Museum of Modern and Contemporary Art/MMCA (Seoul), Espace culturel Louis Vuitton (Paris), Theatreworks (Singapore) for a screening at ICA (London), FACT (Liverpool) for a screening at Liverpool Biennial 2006 and Garage CCC (Moscow) for a project at the 54th Venice Biennale. 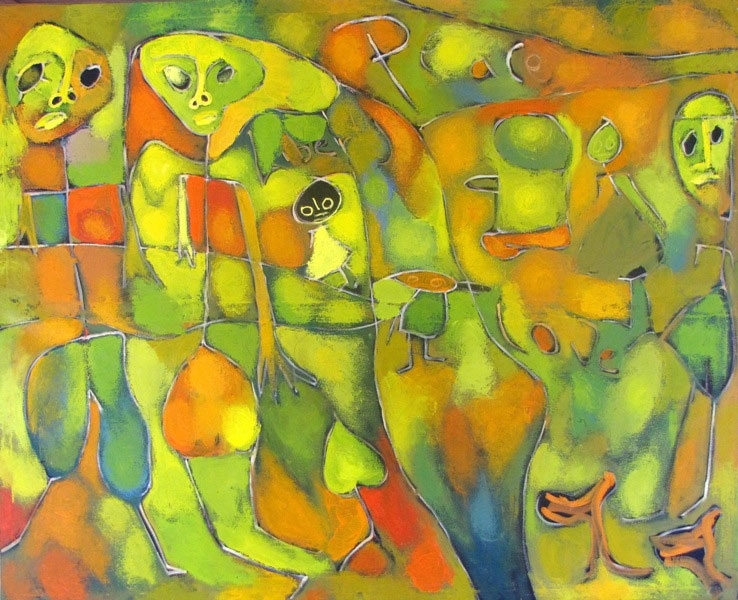 Her work is part of public and private collections in Australia, Indonesia, Singapore, Taiwan, China, Netherlands and the USA, including in the Singapore Art Museum, Queensland Art Gallery/Gallery of Modern Art, He Xiangning Art Museum, and Stedelijk Van Abbemuseum where it is part of the permanent exhibition. Tintin Wulia is a recipient of the Australia Council for the Arts' Creative Australia Fellowship 2014-2016. During her artist-in-residence period at the Slade School of Fine Art, Wulia will also develop components of her project Trade/Trace/Transit (2014-2016), a series of interventions involving a close-knit socio-economical network of cardboard stakeholders, comprising multinational groups in Central, Hong Kong. The project is supported by the Australia Council for the Arts' New Work – Mid Career grant and will culminate in a solo show in Hong Kong, mid 2016, co-supported by Osage Art Foundation. The Slade School of Fine Art has had a wonderful and ongoing relationship with the Visual Arts Department, School of Fine & Applied Arts, Bangkok University, Thailand sending recent graduates to Bangkok Thailand to be artist in residence in Bangkok University between 2003 and 2017. 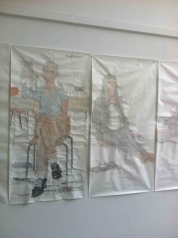 From February to April 2017, Ellie Pratt and Barbara Wesolowska participated in outgoing residencies at Bangkok University, as part of the Transcultural Arts Network, with support from Cass Art. Their reports about their experiences can be read by clicking on the links below. Head of Undergraduate Painting, Andrew Stahl received grants from the British Council to be artist-in-residence at Chiangmai University Thailand in 2000, at Silpakorn University Bangkok in 2003, travel was supported by the Deans Fund. The British Council also invited Andrew Stahl to participate and assist in the nomination for Monologue Dialogue in Bangkok Thailand in 2006. He also was a co-organiser of Monologue Dialogue 2 with Bischoff Weiss gallery in 2008 when the artists in Thailand were invited back to participate in a show in London with Nipan Oranniwesna as artists-in-residence at the Slade. Andrew Stahl also received as part of TAG, a British Council grant from ‘Connections through Culture’ to visit Hong Kong to further develop a residency programme and future grant applications. TAG also arranged for the Slade to participate with Bangkok University as part of the ASEM DUO Thailand 2010 exchange programme with Slade Director Professor Susan Collins doing a residency at Bangkok University exchanging with Associate Professor Tuksina Pipitkul of Bangkok University who came to the Slade.